I spent some "quality time" with the Gypsy today and had a lot of fun figuring out how to make some new designs that take advantage of the "grouping" feature offered by the Gypsy. This will be a huge timesaver in designing but there is a catch - right now the previewing and cutting of the complex designs is extremely slow. I wonder if some people have been assuming that the machine is frozen and have given up because of the length of time needed to preview the welds and cut these designs. Remember, patience is a virtue! Most Design Studio users have been wishing for a true "grouping" feature ever since the Design Studio software came out. I have been able to make many designs that are "adjustable" by using the nudge arrows to move items into position while keeping them all in the same selection box, but this is a slow and tedious process. It is also impossible to change the angle, stretch or skew and individual element within the selection box. 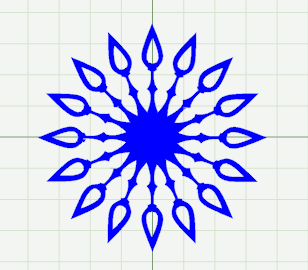 I made a sort of snowflake design using an element from the Gypsy Wanderings cartridge (one of the two exclusive cartridges preloaded on the Gypsy). 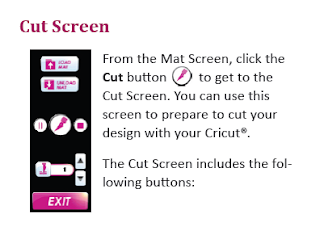 This screen shot shows the keypad position of the element that I used - I think it is a clock hand or pointer of some sort. I took a screen shot of the actual element since the keypad icon is so small! I made a pair of hands by overlapping two images and aligning the holes. Once I did this, I grouped the two together by selecting first one hand, touching the "group" icon (it turns yellow) and then selecting the second hand and touching the "group" icon again. Once the items were joined into a group there was a light grey box surrounding them. I then used the "duplicate" button on the Advanced tab to create additional grouped sets of hands. The "duplicate" button is to the right of the preview eyeball and looks like two overlapping squares. I made eight pairs of hands and arranged them by turning them at a rotation of 22.5 degrees and aligning the center hole. I wanted a solid center so I added a circle that I sized to fit on top of the hole. When I had the elements arranged, I grouped all of the items and touched the weld button. Since they were grouped, I only had to touch the button once. When I previewed the design, I was not happy to see that, except for the center cutouts in the tips of the hands, the lines were pale gray which means they would not cut. Obviously, this was not working so I thought about how I might be able to "fix" it. In Design Studio, the order in which items are added to the design is sometimes significant, so I decided to have another try. I selected the entire image and clicked the "ungroup" button. Then I started with the center circle, touched it to turn it blue and then touched the "group" button and methodically added the hands by tapping each of them in order around the circle. When they were all selected (turned blue) I touched the "group" button once more. 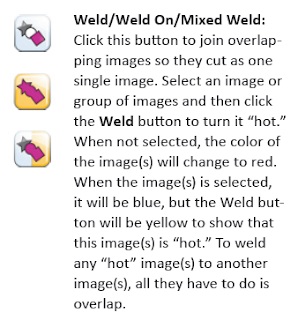 When the entire group was selected the items were blue - when I tapped off the design, they were red, indicating that weld had been selected for all of the items. I tapped the eyeball to preview and watched the little hour glass for a very long time.....probably 8 - 10 minutes. Finally, the preview was built and there was a red cutting outline indicating that everything was welded together properly - Eureka! I took the Gypsy to my Cricut and pressed the "cut" icon (blade) on the Basic tab. 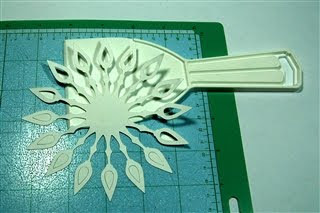 One by one the pieces of the design turned pale gray - I believe this indicates that they are being read for cutting. This took a long time again but finally the screen moved to the "cut screen" so I loaded the mat and tapped the blade to start the cut. The Gypsy sat and "thought" for a long time again and then - cut the design! But now for the really exciting part! I could have easily made this design or a similar one in Design Studio up to this point. 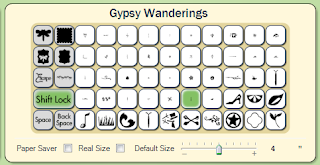 The magic of the Gypsy is that I was now able to select the grouped design, duplicate it by tapping the duplicate button and then resize the design all at once! 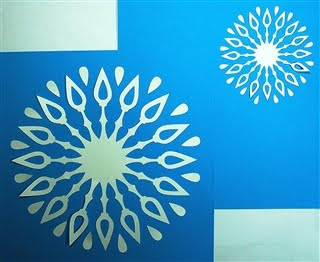 I did a "save as" of the file and made a new file with five inch snowflakes - quick and simple. When you remove the cut from the mat, a wide plastic putty knife is a great help. I was able to lift the design , leaving the small center bits from the tips on the mat. 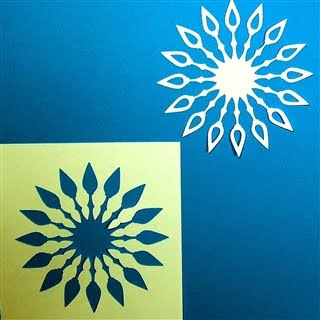 I saved the teardrop cutouts and interspersed them with the tips to make this design - if you want to do this be sure to take care in lifting the pieces. 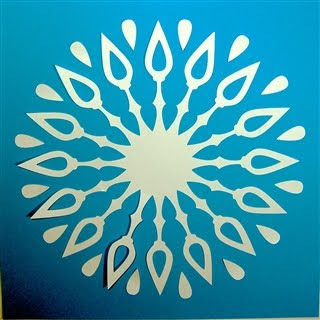 The outer offcut is also attractive and could be used in a project - I always like the positive/negative effect! I hope the explanation I gave about how I did this is helpful to new Gypsy owners. If you like this design and don't have a Gypsy you can do something similar but it won't be resizable due to the angles of rotation required. 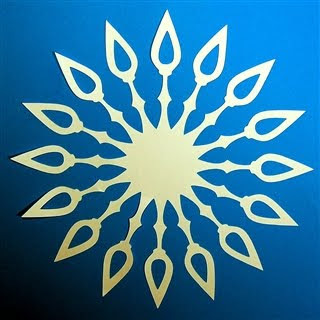 This LINK will take you to an old post where I made snowflakes using elements from Fabulous Finds. I will still try to get a video made but I am not happy with the screen resolution with the Flip and when I use my larger video camera I get a nice recording but I have trouble with the video format for editing and uploading to YouTube - I'll keep trying! Now, if you use a cart that is not exclusive to the gypsy, and group something, and save the file. Can you open that file in DS and does the item stay grouped? tx for all your hard work & explanations. i haven't had a chance to experiment as much as you have but i am benefiting from your exploration. again tx for everything you do, it is much appreciated. you are just too amazing Diane... wondering, should I get one??? I am not sure if you are really that happy with it... is it worth the money? You asked the $64,000 question! I do not know if that is possible since we are not yet able to transfer the files between the two programs - It will be great if it turns out that the items stay grouped (or if they just add grouping to the Design Studio program). It is hard to say if you should get one at this point. The gypsy has lots of great features and the two cartridges included are really good ones. I am sure that the kinks will be worked out so it all depends on your priorities - sooner or later you will probably end up wanting/getting one! It is a very nice addition to your tools if you go to a lot of crops or travel frequently.